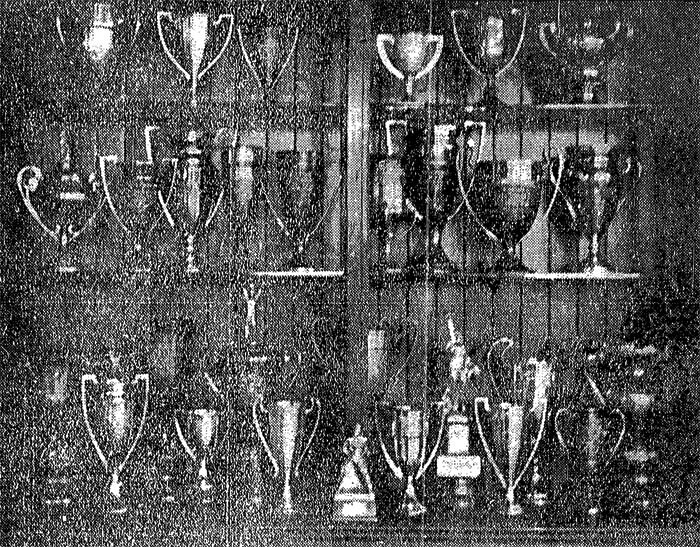 Above: This group of 27 cups and two statues, of which the Falco athletes and officials are very proud, occupies a prominent place in the Falco Auditorium soon to be closed indefinitely. 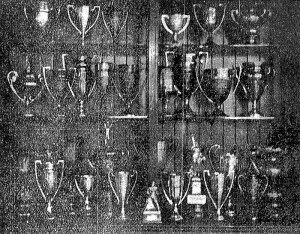 There are 14 cups won in basketball, six in baseball, two in soccer and others for various sporting and field day event. The time covered is from 1920 to this year. The Falcos excelled in basketball, winning nearly every time they were in the Dusty league. Whatever happens in the future of the Falco hall, the cups will be taken proper care of. 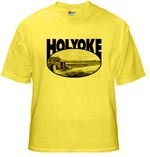 For an indefinite period there will be no organized athletics at the Farr Alpaca plant at Holyoke. Falco Hall is to be closed and the concern will not be represented in the Industrial baseball League this season, whereas in the past the Falcos have been among the bulwarks of the circuit in both baseball and basketball. Joe Bower, in charge of Falco athletics for some years, will resign his position May 1, when Falco hall is closed, and has no definite plans for the future.